If you look at Felice Nazzaro's career, there's a good chance you'll recognize the skills he crafted as the original template for not just a racing champion, but one of the "greats." He was the prototypical talent for those who came after to emulate. He was the talent measuring stick of his contemporaries for many years. Nazzaro was known for his race management in a formative era where most drivers simply went as fast as they could until things broke. Like Rick Mears or Al Unser Sr. decades later Nazzaro took a more considered approach to race strategy. He hung in the mix of front runners but did not feel pressured to lead early on. Nazzaro calculated how hard to push his tires and the decidedly fragile engines of the day. When the critical moment late in a race came, Nazzaro was decisive. He pounced, fully capable of busting off the contest's fastest lap. Having saved his car for putting it through the absolute test at absolutely the right time, Nazzaro was formidable. His discipline may have had a lot to do with his longevity. In an age of incessant deadly accidents, Nazzaro endured 25 years - from 1900 to 1925 - most of it with Fiat. World War I did interrupt his driving, but he was never away from cars, engines, and general mechanics. He tried his hand at launching his own car company. While that in no way measured up to his on-track accomplishments, it further refined his sense of how far to push a car. Nazzaro returned to racing and by 1921 was again with Fiat, and immensely competitive. He had several top finishes including a victory in the 1922 French Grand Prix - an unheard of 15 years after his first win in that important race in 1907. Among the greatest wins of a stellar career, Nazarro scored two victories in the Targa Florio and prevailed in the German Kaiserpries. 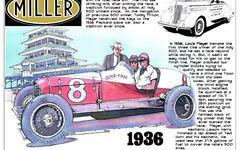 He finished third in the first American Grand Prize and also raced in the Vanderbilt Cup. He set speed records at Brooklands but was also the center of controversy at the famous concrete English modified oval. In 1907 an electric timing device recorded him in his Fiat at 121.8 mph. Handheld timers were more than incredulous, reporting a speed of 107.8 - far more likely. The discrepancy was never resolved but it does put a fat asterisk on any claim to the world land speed record. Nevertheless, Felice Nazzaro remains an acknowledged master of his time. The image you see here of Nazzaro in his Fiat at the 1913 Targa Florio.